The chart has been calculated using Investment Analyzer InvAn-4. The calculation is based on a rank of stocks. 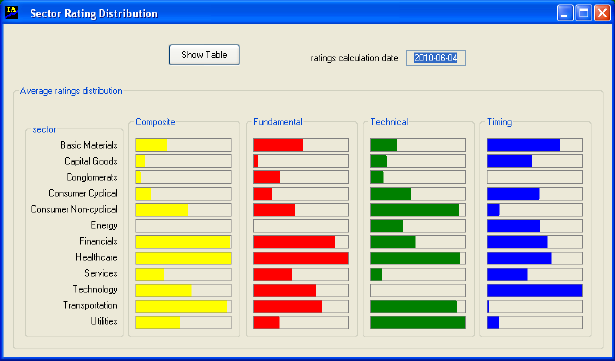 Sector ranks distribution allows making comparative analysis of sectors’ ratings (sectors are formed from the stocks recorded in InvAn-4 internal database). The highest ranked stocks are expected to be the most probable best performers within the next three-month period. Stocks are ranked on the basis of the composite rating which is a combination of fundamental, technical, and timing ratings. Such combination allows realistic modeling the quality of a company and its stock in the market. Each stock belongs to a general market, a particular sector and industry. An individual stock performance depends on the general stock market performance, as well as, on the sector performance. History evidences that different sectors perform differently in different periods. Therefore, choosing a right sector at the moment of investing can increase the chances of successful outcome. The chart below shows the comparative analysis of expected sectors’ performance for the three months of 2010 summer. These 12 sectors composed of more than 500 US and Canadian stocks. Financial and Healthcare sectors look the best, the Energy – the worst. The question still remains if the stock market is going to be bullish this summer. The chart has been calculated and plotted using Investment Analyzer InvAn-4. Its calculation based on a rank of stocks. The highest ranked stocks are expected to be the most probable best performers within the next three-month period. Stocks are ranked on the basis of the composite rating which is a combination of fundamental, technical, and timing ratings. The combination allows modeling quality of company and its stock very realistically.